In last week’s post, I highlighted a book called The Bad Mood by Moritz Petz. It is a children’s book that explores the effect our moods can have on others and our relationships with them. 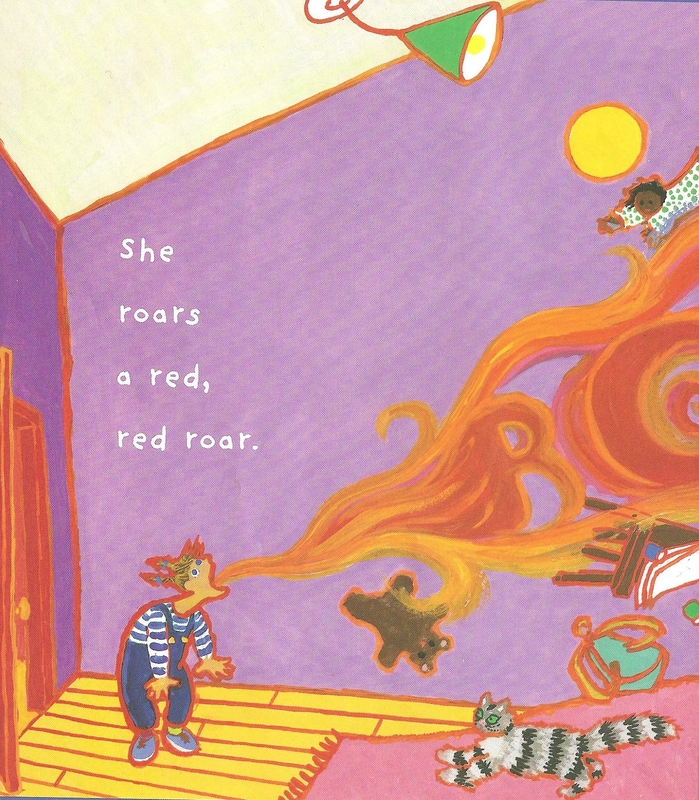 Today I highlight another children’s book, one that I feel addresses the emotion of anger in a profound way: Molly Bang’s When Sophie Gets Angry, Really, Really Angry…. Sophie was busy playing when her sister grabbed Gorilla. / “No!” said Sophie. / “Yes!” said her mother. / “It is her turn now, Sophie.” / As her sister snatched Gorilla away Sophie fell over the truck. In this opening scene, the reader/listener is introduced to Sophie and immediately the inciting incident takes place. Sophie’s sister grabs a toy away from Sophie. And to make matters worse for Sophie, her mother defends the sister’s actions. Now, it is unclear whether or not there is a behind-the-scenes agreement establishing that the two sisters are to take turns with the toy (apart from the generalized value of sharing), or if the toy belongs to one and not the other, but there is a clear sense of injustice from Sophie’s perspective. Sophie’s “No!” could equally protest against the “grab” as much as she may have been protesting the loss of the toy. To have her mother—a figure of nurture and authority—contradict Sophie (who seems to be in the right) adds to this sense of injustice. Confounding things even further for Sophie, the sister (who has the mother’s approval to take the toy) snatches the toy away instead of waiting for Sophie to surrender it. And if that wasn’t enough, Sophie falls over a truck in the process of the “snatching”. Oh, is Sophie ever angry now! / She kicks. She screams. She wants to smash the world to smithereens. / She roars a red, red roar. / Sophie is a volcano, ready to explode. I can still recall the first time I read this scene and I remember the discomfort I felt (I have always had zero tolerance for temper tantrums). I wondered where this story might lead and if Sophie and I would come out as friends in the end. Well, we have. In fact, this has become one of my favourite moments in the story. As previously discussed, there is a sense of ‘justified’ anger… there is far more going on inside of Sophie than merely a child throwing a tantrum over a toy. Within the context of the story as a whole, this has become a moment when I feel the reader/listener can celebrate Sophie in the midst of her deeply-felt, intense emotion. It is a celebration of character, really—knowing who Sophie is and how/why she reacts in the way she does and to the things she does. There is significant value in being able to celebrate Sophie’s character. For example: my son—who is easy-going, gentle-natured and peace-loving—has a tendency to avoid the Sophie’s in the world. Here is an opportunity for him to know and experience a character that reacts much differently to a situation than he would—and for him to know that different ways of dealing with anger are acceptable (each way has its benefits and downfalls). This is not to say that we get bogged down in discussion about anger while reading Sophie’s story. The celebration of Sophie’s character comes naturally and we both appreciate the story for much more than this. I simply highlight one valuable aspect out of many. Sophie’s anger—like a roaring animal—seems threatening and wild, yet it can also be viewed as natural. Sophie’s anger—like a volcano—seems explosive and dangerous, yet it too can be viewed as natural and even as necessary (after all, the due course of a volcano is to erupt). And when Sophie gets angry—really, really angry (Pabam!) she runs! / She runs and runs and runs until she can’t run anymore. / Then, for a little while, she cries. / Now she sees the rocks, the trees and ferns. She hears a bird. / She comes to the old birch tree. She climbs. / She feels the breeze blow her hair. She watches the water and the waves. / The wide world comforts her. Sophie runs when she is angry. And then she cries. So much could be discussed here, but I would like to focus on the role of nature in the story (a profound theme) and what I believe is the first “eucatastrophic” moment. 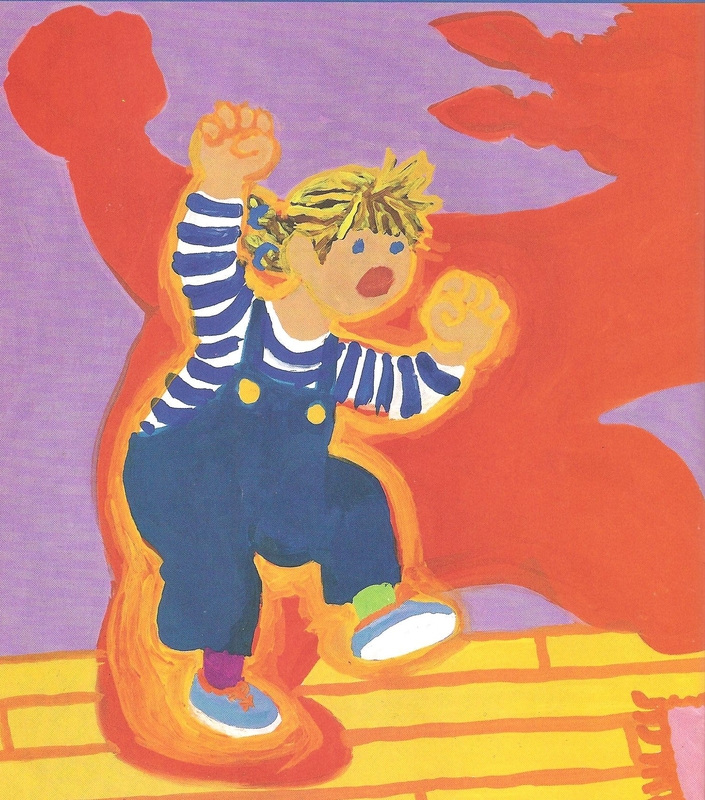 Some have criticized Molly Bang for “encouraging children to run away when they are angry.” I feel this criticism is unwarranted and I suggest that the text indicates the opposite—that Sophie does not run to avoid dealing with her anger, but that she runs in order to deal with her anger. Running helps Sophie release the explosive emotion, but it is also significant to note that she runs to a very specific place—the old birch tree. Here Sophie “watches the water and the waves. The wide world comforts her.” The text has come full circle and it is the very world that Sophie wanted to “smash to smithereens” that, in the end, comforts her. Eucatastrophe occurs for Sophie on this level, but what about the situation back at home? This I’ll save for discussion in a future post. How about you? Do you relate to Sophie? How do you or your children express anger? What are the ways you deal with anger? My son is feeling tired and “a little grumpy,” he tells me. He goes to the couch to lie down and have some quiet time. When I ask him a question from the other room his response is mildly—but not completely—snappy. Clank. My heart drops with the weight of lead to the floor. You see, I’m usually the grumpy one in our household. And I typically use my grumpy moods to justify snappy or impatient remarks, expecting my husband and children to understand. My son is almost always good-natured and easy-going. I see the irony. I see the double-standard. I see the benefit of heeding my own advice. A bad mood does not justify treating others poorly. Oh, the lessons I learn through teaching my children! 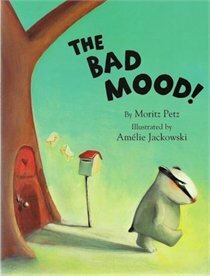 I’m grumpy often enough that I bought this children’s book, The Bad Mood by Moritz Petz; illustrated by Amelie Jackowski. I gave my husband and kids permission to pull it out as needed. It shows the effect our moods have on others and our relationships with them. Plus the illustrations are gorgeous. How about you? What lessons have you learned through teaching your child(ren)? Do you have a favourite book that helps address bad moods? Have you ever caught yourself in a double-standard or a moment of irony with your kids? Your comments are welcome. © Kelly Dycavinu, 2012. Unauthorized use and/or duplication of this material without express and written permission from this blog’s author and/or owner is strictly prohibited. Excerpts and links may be used, provided that full and clear credit is given to Kelly Dycavinu with appropriate and specific direction to the original content.